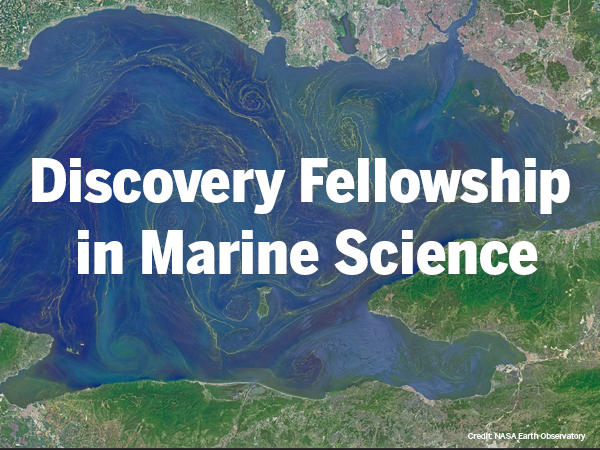 The University of Texas Marine Science Institute (UTMSI) in Port Aransas, Texas invites outstanding candidates for the 2016 Discovery Fellowship in Marine Science. This highly selective doctoral studies fellowship is open to graduates with a bachelor or master of science received within two years of application. The fellowship will support an exceptional student with full tuition, competitive salary, fringe benefits, and subsidized housing for five years. The successful candidate will engage in a selective course of study at the University of Texas at Austin in the first program year and thereafter engage in the intellectual life of the Marine Science Institute in Port Aransas, TX. The candidate will have the freedom to pursue studies of his or her choosing with any UTMSI faculty member. Fields of study includes but are not limited to fish ecology or physiology, environmental toxicology, biogeochemistry, chemical oceanography, microbial ecology and metagenomics, phytoplankton molecular ecology, zooplankton ecology, ecosystem dynamics, or marine ecology. The candidate, mentored by faculty advisor and a four-member advisory committee will be expected to develop and compete for extramural grant support for years four and five of the fellowship program. Students interested in applying are encouraged to contact UTMSI faculty members to explore potential fields of study. The Marine Science Institute, founded in 1941 at Port Aransas, and the first marine laboratory established in Texas, offers outstanding faculty and facilities in close proximity to unique estuarine, coastal and blue water habitats, including the 185,708-acre NOAA Mission-Aransas National Estuarine Research Reserve. The marine science faculty engage in world-class research from the Gulf of Mexico to the arctic and Antarctic. The Institute also supports outstanding public education and outreach programs for disseminating research and public service opportunities. The University of Texas at Austin is responsive to the needs of dual career couples and is dedicated to work-life balance through family friendly policies. We strongly encourage applications from women, minorities, veterans, and individuals with disabilities. Review of applications will begin December 1, 2015. The University of Texas at Austin is an Equal Opportunity Employer. A background check will be conducted on applicant selected.